The growth of the service industry in the past two decades has prompted a number of questions about this sector of the American economy and the reasons for this trend. Some questions about the growth of the service industry include: What is the service industry and what types of businesses operate in it? What are the trends in growth for the service industry and the reasons underlying its growth? How is the service sector affected by recessions and economic down-swings? What are the human resources issues associated with the service industry? How is offshoring affecting American service jobs? What is expected in the future for the service industry? In the U.S. economy, jobs can be categorized into sectors, which can then be split into divisions, each of which include various industries. There are two major sectors in the U.S. economy, as identified by the U.S. Standard Industry Classification System: the goods-producing sector and the service-producing sector. The goods-producing sector includes agriculture, forestry, and fishing; mining; construction; and manufacturing. The service-producing sector includes the divisions of (1) transportation, communications, and utilities; (2)wholesale trade; (3) retail trade; (4) finance, insurance, and real estate; (5) public administration; and (6) services. 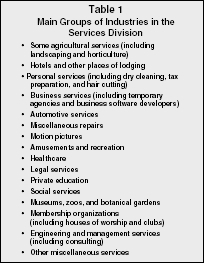 This sixth group—the services division—includes a number of industries (see Table 1). The service sector is difficult to define and to encompass. There are a number of ways to identify the sector, its divisions, its industries, and the types of jobs within them. The general category of the service division includes a wide variety of industries, but can be categorized into primarily consumer-oriented (providing a service directly to a consumer), primarily business-oriented (providing a service directly to another business) or mixed (providing services to both businesses and individual consumers). Alternately, the services division activities can be described by their economic activities as physical, intellectual, aesthetic, and other experiential activities. Physical activities involve working with objects; examples include repairing cars, landscaping, cutting hair, or preparing a meal. Intellectual activities involve providing education or training, such as at a university or trade school. The aesthetic activities entail providing consumers with artistic or visual experiences; museums, theater performances, art shows, and musical performances are examples. Finally, other experiential activities involve providing customers with recreation, such as in amusement and theme parks, zoos, or campgrounds. A final way in which to categorize services is by what is transformed through the service. A service may transform a physical object, which occurs when something is repaired, altered, or improved. Having an article of clothing custom-made, a room remodeled, or an appliance repaired would involve transforming a physical object. Service division jobs may also change a consumer. Examples of changes to consumers are education, whereby the consumer learns knowledge or skills; health care, in which a person's health is improved; or personal services, such as when a hairstylist cuts a consumer's hair. A change to an organization is a third type of transformation involved in the service industry. For instance, a management consulting firm may make changes to an organization's structure or business processes to improve it. The final set of jobs in this categorization captures those professions in which there is no apparent object. For example, when an attorney provides legal representation to a client, or in professional sports competitions a service is provided, even though no specific object can be identified. Data from the U.S. Bureau of Labor Statistics indicates that more than 97 percent of the jobs added to U.S. payrolls from 1990 to 2002 were provided by the service-producing sector. In 1984, the number of jobs in manufacturing was relatively comparable to the number of jobs in the services, but by 1999, the service industry employed about twice as many individuals as manufacturing or government. The three industries within the services division that experienced the most growth in the last decade have been (1) business services, (2) health care, and (3) social services. The business services areas in which the largest number of jobs were gained were personnel supply and computer services. The personnel supply area includes organizations such as temporary employment agencies, traditional employment agencies, and other organizations that supply labor to other companies. The computer services industry includes mass-produced software, custom programming, custom computer systems design, and computer leasing. The primary reason for growth in both of these areas has been changes in business processes. In the health care industry, there were four components that added large numbers of jobs: offices of physicians and other practitioners, nursing and personal care facilities, hospitals, and home health care. These components gained 430,000 to 1.2 million jobs each between 1990 and 2002. Two main reasons for this increase are new medical procedures, with which additional personnel are required to perform them, and because of the increased number of elderly persons in the U.S. and their requisite health care needs. The third industry that gained the most jobs in the services division is social services. Social services encompass daycare for children, residential care for the elderly, and other family services; engineering and management services; private education; recreation and amusement; and membership organizations (e.g., houses of worship). The reasons for growth in the largest growth area of the services division—the business-oriented services—can be linked to three broad economic developments relevant to those services: contractual arrangements, increased construction activity, and changes in technology. First, contractual labor arrangements, such as outsourcing, have created opportunities in the field of personnel supply (e.g., temporary agencies and employee leasing). This is due primarily to the increased demand for temporary employees from U.S. businesses that want more flexibility in staffing and more control over labor costs. Additionally, as temporary and leasing agencies provide more training for the employees that they place with companies, this has made use of such agencies more attractive to many companies. A related reason for increased demand of such agencies is that many core employees are hired after a stint as temporary employees, which reduces recruitment and staffing costs for the companies utilizing temporary agencies. These contractual labor arrangements have also contributed to the growth of management services, such as consulting and facilities support. Finally, engineering services have changed; many engineers now operate under these new contractual arrangements rather than working for one employer as an employee. The second major economic development that has led to growth in jobs in business-oriented services is the increase in construction activity. More construction brings higher demand for engineering, architecture, surveying, landscaping, and horticultural services. The third major economic development, improved technology, has driven a higher demand for computer services, such as computer repair, technical support, and software development. Management and engineering services, in the form of consulting, have also grown with this improved computer technology. The U.S. Bureau of Labor Statistics (BLS) has studied the effects of economic recessions and expansions on the industries in the services division. The common wisdom has been that the service industry resists economic recessions; and to some extent that is true. Typically, the services do not show a decline in employment during the course of a recession. However, the BLS has found that some areas of the service sector are affected by economic downturns, indicated by a slowing of job growth. Most areas of the services division are cyclical, which means that they are likely to experience slow growth or may even lose jobs during a recession. Engineering and management are the most cyclical areas of the services division and typically lose jobs in the average quarter of a recession. One reason for this is that these types of companies (e.g., management consulting firms, architectural firms) depend heavily on projects, not on ongoing production, which are likely to be cut back in times of economic recession. Business services are also cyclical, particularly with personnel supply (e.g., employment agencies) and computer services (e.g., custom software creation). Other cyclical areas are in agricultural services, because of the landscaping and horticultural component; automotive services, such as car rentals and repairs; miscellaneous repairs; the lodging industry; personal services, such as laundry, cleaning, and garment services; and motion pictures. There are five areas of the services division that are deemed at least minimally counter-cyclical—that is, they gain jobs more quickly during a recession than in normal times. Health care services are the most counter-cyclical, gaining jobs rapidly during an economic downturn. This is likely due to the nature of this industry; health care is unaffected by recession because consumers see it as a necessity rather than something that can be used less often depending on the economy. Moreover, because much of U.S. health care costs are supplemented by Medicare, Medicaid, and private insurance, this funding is not susceptible to competition with other types of purchases, and the benefits continue to be available to Americans during times of recession and unemployment. The health care industry is one that is truly counter-cyclical; however, there is no strong consensus as to why this is. There is some evidence that health actually improves during economic recessions in the reduced use of tobacco and through improvements in diet an exercise. Thus, the demand for health care is unlikely to be driving the growth of this industry. Rather, some experts believe that the health care industry benefits from higher unemployment rates during a recession, because more people are likely to pursue jobs in the health care industry when unemployment is high. Because this industry tends to have many job vacancies, a recession may create a higher supply of employees to fill these jobs. The other counter-cyclical service sector groups, as identified by the U.S. Bureau of Labor Statistics, are not truly counter-cyclical, in that they do not show statistical significance of this characteristic. However, they are likely to be less cyclical than the other areas of the service sector. One of these ostensibly counter-cyclical areas is private education, which is in higher demand when more people are unemployed due to an economic recession. That is, if people can't find jobs, they tend to go back to school, resulting in higher demand for teachers and administrators in public education. The other areas—child day care, amusements and recreations, and private colleges—exhibit their counter-cyclical tendencies because they tend to have fairly unattractive, low-paying jobs, which people are less likely to take in strong economic conditions, but more likely to take when the unemployment rate is high. A higher unemployment rate means that more attractive job opportunities in other industries are less available, and people must turn to less attractive jobs. Labor shortages in these lower paying industries are likely to be high in times of economic expansions, and thus these areas are less likely to be cyclical in their nature. Job analysis, which involves gathering information to understand how to successfully perform a job, is likely to be conducted differently in service jobs than in manufacturing jobs. Because much of service work is knowledge work, in which job activities are less observable, this may mean differences in the way that job analysis is conducted. In service jobs, observation of job tasks may not be as useful as interviewing job incumbents or using a standardized form such as the Position Analysis Questionnaire. Recruitment and selection practices in the services sector are as varied as the types of positions in this sector. The areas that are counter-cyclical or non-cyclical, however, may require stronger or more creative recruitment practices. As mentioned previously, many of the job areas that grow during economic recessions do so because there are fewer attractive job options available. Thus, during strong economic conditions, these areas (i.e., health care, day care, amusement and recreation, and private colleges) may have difficulty recruiting job applicants, and may need to be more innovative in their approach. During strong economic times, this may also mean that these counter-cyclical areas may find a lack of suitable job candidates, which may mean that selection criteria are changed, such that some skills are trained by the organization rather than having them present upon hire. Training in the services sector may require increased attention to technology skills, as many service sector jobs now require the use of computers. Even entry-level retail jobs make use of computer technology for inventory and sales, and the ability to use these machines is critical. Additionally, customer-service skills are a crucial training need in many service industry jobs; thus, this type of training is likely to increase in value in service jobs. Performance appraisal in the service sector is likely to be different than in the goods producing sector. While a physical accounting of performance through measuring production is possible in manufacturing and similar industries, it is less possible in service jobs. There may not be observable outcomes in service sector jobs. Thus, appraising performance by measuring behaviors is more appropriate for this sector. Additionally, outcomes other than production can be measured in service jobs: customer satisfaction, sales in a retail location, or other outcomes can be meaningful ways to measure performance. Compensation in the goods-producing sector can be specifically linked to productivity (e.g., actual goods produced), but tying compensation to outcomes in the services sector may be more difficult. Some outcomes are easy to measure, such as in the number and value of homes sold by a real estate agent, but others are more difficult to assess, such as the degree to which a customer service representative has successfully resolved a customer's problem. Thus, compensation that effectively rewards and motivates employees must be based on a performance appraisal that reliably and accurately captures performance. Human resources managers should use caution when developing rewards based on outcomes; a poorly designed incentive system may result in employees aiming for outcomes at the expense of customers. For instance, if a car repair shop pays employees for each new set of brakes they install, employees may begin to try to sell brakes to customers who don't need them in order to receive extra pay. Labor unions originally grew in prominence in goods-producing jobs but now also represent many employees in the service industry. Although labor union membership has declined overall in recent decades, unions are still a presence in both manufacturing and service jobs. For instance, the Service Employees International Union (SEIU) is the largest and fastest growing union in North America, representing employees in areas of health care (e.g., nurses and nursing home employees), public services (e.g., schoolteachers and other government employees), building services (e.g., janitors and security guards), and industrial and allied employees (i.e., services in industrial companies). The SEIU has actually grown in membership over the years, from 625,000 members in 1980 to over 1.8 million today, and this growth has coincided with the increase of jobs in the services industry. Many service sector employees seek representation from a union due to concerns about pay, benefits, and job security that may not be as strong as in some other areas of the economy. One topic that is becoming increasingly important to the services division of the U.S. economy is offshoring. Offshoring occurs when U.S. jobs and production are relocated to a foreign country. Offshoring can be contrasted with outsourcing, which occurs when a company contracts with another company to perform part of their work, but does not necessarily shift to a foreign country. While offshoring has received a great deal of recent media attention and increasing in the U.S., levels of job losses in the service sector due to offshoring are small relative to total U.S. employment. McCarthy indicates that an estimated 103,000 jobs moved offshore in 2000, and Mark Zandi estimates that the loss in service jobs due to offshoring was about 75,000 per year from February 2001 to October 2003. U.S. employment statistics further indicate the small risk for offshoring of service jobs, with approximately 14 million jobs currently at risk for offshoring, but about 96 million jobs at low risk for offshoring in 2000. However, these estimates may either understate or overstate the total effect of offshoring on U.S. employment. New jobs may have been created overseas by U.S. companies, rather than shifting existing jobs away from the U.S.
Offshoring of service jobs has increased and is likely continue to do so, experts believe. Research indicates that offshoring has increased pace in recent years. This trend is worrisome, because of the possible impact on the U.S. economy. Some analysts believe that the service sector taking longer to rebound from the 2001 recession is partly due to offshoring. McCarthy estimates that a cumulative job loss of 3.4 million jobs and respective wage loss of about $151 billion will occur by 2015. The increase in offshoring has caught the attention of U.S. lawmakers, as Congress and state legislators have focused attention on the issue and have even introduced legislation to limit offshoring. India has gained many U.S. service sector jobs through offshoring in recent years. Much of this is due to India's focus on becoming more prominent in the world in their information technology capabilities. Additionally, many Indians now pursue higher education to give them skills that prepare them for jobs in which there is a labor shortage. For instance, many U.S. employers are now hiring Indian call center agencies to provide customer service to clients in North America. Calls from overseas (e.g., American) customers are routed to an Indian call center, where an Indian employee who speaks English (often with little Indian accent) assists the customer with his or her computer problem or other customer service need. Because skilled Indian employees cost far less than similarly skilled American employees, offshoring for this job is very attractive to American companies wanting to cut costs. Author Paul Davies notes that the annual cost in 2003 of an American employee in a U.S. call center was about $43,000 but that a similarly skilled Indian employee cost about $6200. As detailed above, the U.S. economy has experienced a shift from goods-producing jobs to service-sector jobs. Projections by the U.S. Department of Labor's Bureau of Labor Statistics expects this trend to continue with service jobs accounting for approximately 20.8 million of the 21.6 million new jobs from 2002 to 2012. In particular, jobs in the education and health services areas are expected to grow the fastest, adding more jobs than any other area of this sector at an estimated 31.8 percent Additionally, professional and businesses services (e.g., employment services; professional, scientific, and technical services; computer systems design; management jobs) will grow at a high rate (30.4 percent). Jobs in information will increase by an estimated 18.5 percent; this area includes jobs related to software and Internet publishing and broadcasting, and Internet service providers. Another area that will increase is leisure and hospitality, with employment growing by 17.8 percent due to an increased demand for leisure activities, accommodations, and food services. Trade, transportation, and utilities will increase by 14.1 percent in jobs related to transportation and warehousing; the retail trade; and water, sewage, and other utilities. A 12.3 percent growth is expected in employment in financial activities, with increases in jobs in real estate, finance, and insurance. Governmental service jobs should also grow at a rate of 11.8 percent, with jobs in public education and hospitals, state and local governments, and the federal government increasing in number. Finally, other non-governmental services that should increase at a predicted 15.7 percent are jobs in religious organizations, personal care services (e.g., hair stylists), and private household employment (e.g., cleaning services). The services sector is distinct from the goods-producing sector in the U.S. economy, and includes a very wide variety of industries and jobs. The number of jobs in the services sector has been growing in recent years, and data from the U.S. government indicate that this trend will continue. While many service sector jobs are believed to be recession-proof, only some areas of that sector are truly counter-cyclical, and some are simply noncyclical, meaning that they resist job loss during times of economic downturn. As service sector jobs increase in number, there are new concerns for managing human resources, one of which is the issue of offshoring, which is increasingly slowly. Davies, Paul. What's This India Business? : Offshoring, Outsourcing, and the Global Services Revolution. Yarmouth, ME: Nicholas Brealy Publishing, 2004. Garner, C. Alan. "Offshoring in the Service Sector: Economic Impact and Policy Issues." Economic Review—Federal Reserve Bank of Kansas City 89, no. 3 (2004): 5–37. Goodman, Bill, and Reid Steadman. "Services: Business Demand Rivals Consumer Demand in Driving Job Growth." Monthly Labor Review, April 2002. Goodman, William C. "Employment in Services Industries Affected by Recessions and Expansions." Monthly Labor Review, October 2001. McCarthy, John C. "3.3 Million U.S. Service Jobs to Go Offshore." WholeView TechStrategy Research, 11 November 2002. ——. "Near-Term Growth of Offshoring Accelerating." Trends, 14 May 2004. U.S. Department of Labor, Bureau of Labor Statistics. "Tomorrow's Jobs." Occupational Outlook Handbook 2004-05 ed. Available from http://www.bls.gov. Zandi, Mark. "OffShoring Threat." 24 October 2003. It is so helpful for me. I am learning about the development of services industry in USA. Please send me more information about this discipline.